Dignity... It is really that simple. Building Dreamers Coffee House has lead me to reflect a lot about what brought me to this point in my journey, where it all started, and how I got here. I have had a lot of time to reminisce about the last ten years. The message I have been sharing the last 10 years is a very uncomplicated message. 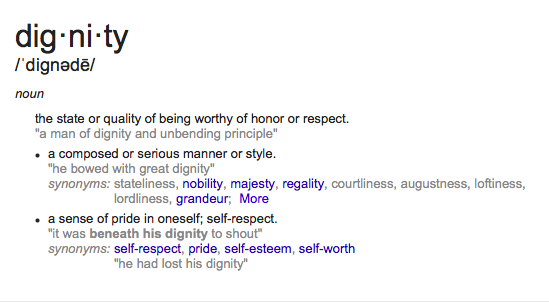 Quite simply the word dignity sums up all I have been trying to say all these years. Right there it is, "The state or quality of being worthy of honor or respect." When I founded the Grand Strand Down Syndrome Society I was seeking dignity for parents who were new to the Down syndrome community and needed support. I was seeking dignity for the mother and father when they receive a diagnosis for their child, at birth or in utero. I wanted a place that would give them the tools and support to navigate their new journey. Give them the love and respect they need, along with support for the whole family. They are worthy of respect. They are worthy of dignity. When I started the IDSC, again, all I was asking for was dignity. Dignity for the child who has been diagnosed with Down syndrome, or any other disability. Every child deserves dignity. My daughter deserves the same dignity as any other human. She is worthy of respect. Not because she is the daughter of someone who started a movement or an organization. Her dignity stands on its own. She and her peers are worthy of dignity. My message about not using the R word, is also about dignity. Every person who has been given the label of intellectually or developmentally disabled is worthy of respect that the title of dignity gives each and every human being. Throwing the r-word around lowers their dignity, and lowers the dignity of others. And now, the dignity of the worker. Every person innately gains dignity through work. Employment brings all of us pride and satisfaction. According to the National Down Syndrome Congress, 20% of individuals who have an intellectual or developmental disability are gainfully employed. That number is too low for me. I hope that by the time MaryEllen seeks employment we have shifted that number to reflect the same percentage as the general population. She is worthy of the dignity that being gainfully employed brings us all. It really has been a very simple message all of these years. Dignity for all, because, indeed, every person deserves it. This entry was posted on Thursday, September 17, 2015 and is filed under Dignity National Down Syndrome Congress. You can follow any responses to this entry through the RSS 2.0. You can leave a response.